Recently I found myself in a wine shop I had never visited before. I love new wine shops– always full of the possibility of some great find, a new name I had not heard of before, a new varietal, an up and coming region. 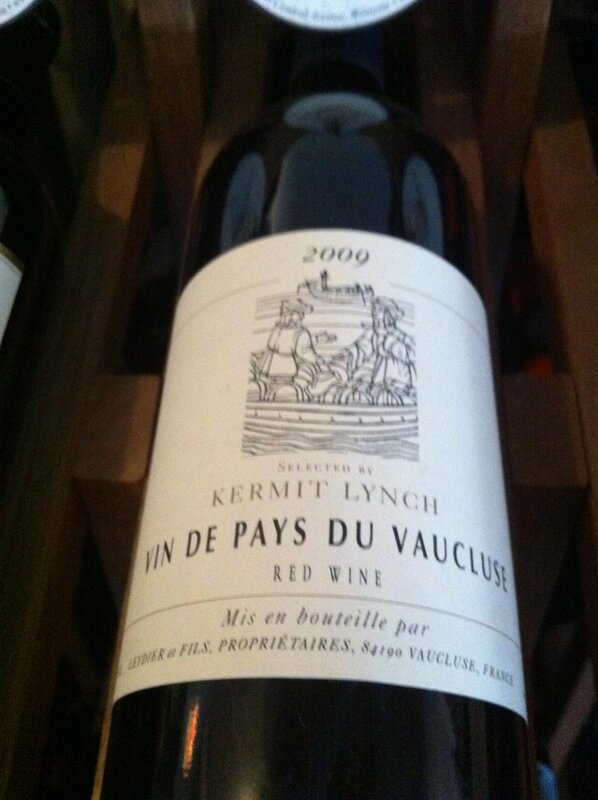 As I trolled my way through the store, at the back, on a shelf marked “Recommended”, I spotted a 2009 Vin de Pays du Vaucluse selected by Kermit Lynch. Normally I would walk past something like this. Nothing against Kermit Lynch, but Vin de Pay generally isn’t worth the trouble. But at $11 a bottle with the endorsement of the establishment right there how could I go wrong? Let’s see: I bought two bottles. For the second tasting of this wine, I paired it with a Moroccan inspired dish. On my travels to Morocco back in early 2001, I was impressed by the ubiquitous lemon chicken. I have come up with my own variation of the dish that requires very little actual cooking time though it does require a little bit of patience while it marinates. Place seasoned chicken in a zip lock bag. Whisk together all if the marinade ingredients in a bowl and pour into the bag with the chicken. Close the bag and toss chicken pieces with the marinade till coated. Refrigerate for at least 8 hours. This is easy since you can do this in the morning before you leave for work and it will be waiting for you when you come home. Remove chicken from refrigerator 1/2 hour before cooking and place in roasting pan. The chicken should be done at this point. However an optional step to ensure browning of skin, is to place the chicken under the broiler for 3-5 minutes until the skin turns golden brown. Serve this with a simple buttered couscous and a rocket salad. You’ll be living large baby! *Cuve is the French word for a vat or tank. A cuve may be made of any material including wood, concrete or stainless steel.